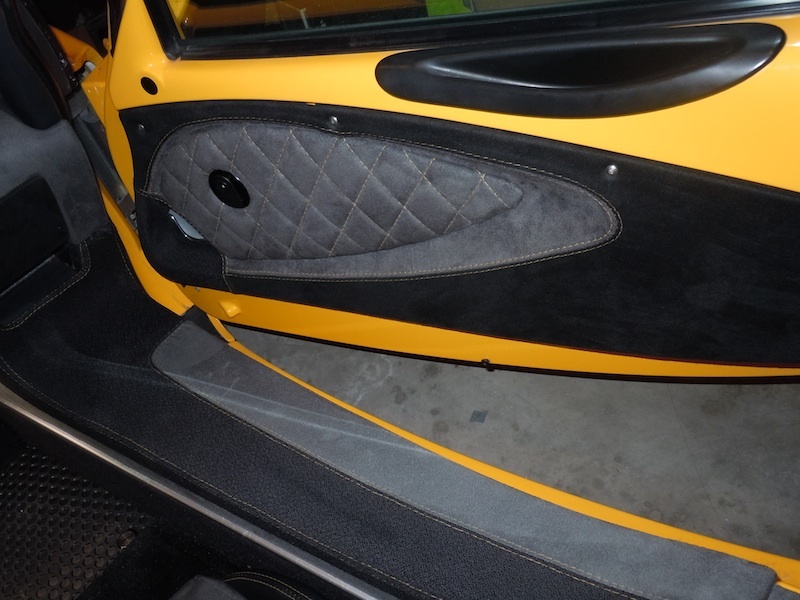 Lets do a thread like the booty thread in the intake/exhaust section of the forum but for custom interiors. I searched the first couple pages of threads and didn't see a thread like this, so I made one . (Hopefully there isn't one a few pages in and I just didn't see it) I eventually want to get some alcantara or leather wrapping done and wanna get some ideas. This includes door cards, seats, dash, and everything else interior related. I wanna see everyones custom interior!! I just posted this in another thread but...custom neoprene covers to protect my oyster seats. What color are your original seats? Here you go..went to sea for a while and told my interior guy he had free reign. The stitching actually matches my Graphite Gray paint and the modified center console made a perfect cupholder. What you don't see is that the hardtop now has a headliner that matches the seats, complete with diamond pattern stitching. I actually now have solid black floor mats (I had the rubber ones in because it was bad weather time). Pics have lot of flash (iphone). I'll get another pic of the seats - they have the same quilted charcoal alcantara on the inserts and the Lotus logo embroidered in the headrest. I basically stole this look from a guy with Tesla that did the same thing. Nice, I like. I love red interior although it wouldn't look good with my chrome orange. I love all the alcantara. I do want to eventually do the whole dash in it like you did. But thats way down the road. How does the alcantara hold up on the side sills to people rubbing on it getting in and out?? The black part of the sills is a rubberized sort of fabric so VERY durable. No issues. The only issue with alcantara on the dash is that it pulls away in some. Yellow99s does interiors for a living so he knows all the tricks - and he's having the same problem! I might have to do that rubberized fabric on my sills, such a pain to keep from scuffing them getting in and out of the car. Do you remember what it was? 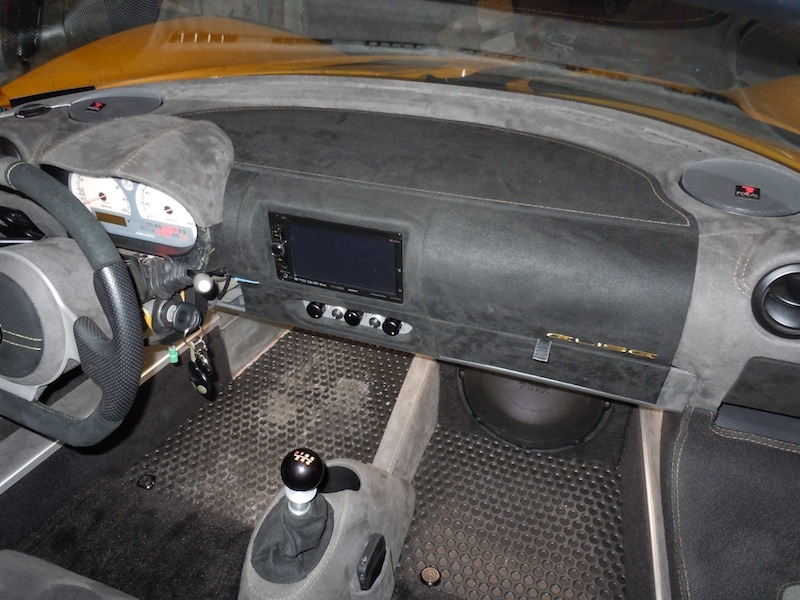 Also Swinglo, your interior shows a LOT of attention to detail (stitching, ets) Looks great. Yeah, my sills have a crap ton of scratches from the PO. How is that rubberized material holding up? Does it look like the alcantara? Do you know the name of that material? Have others done leather and how does that hold up? And a BUMP to this thread....want to see some more interior work! I want to copy your seats. Did you glue over the leather or peel it off first? Real alcantara is expensive! Its so nice though. Love, love, love that green interior! Nice stuff! Lets see some MORE!